At its heart, HOGS is a family business, dedicated to planting seeds of all kinds, literal and metaphorical. 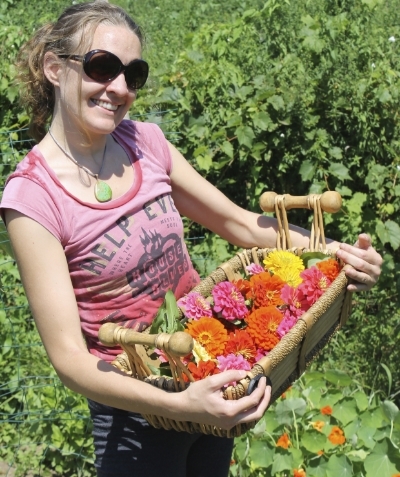 In addition to practical installation and maintenance of organic vegetable gardens and systems, HOGS is committed to educating and celebrating a community of mindful gardeners on Long Island. Some of my earliest, and fondest, memories are of gardening with my grandpa. I remember summer afternoons spent picking tomatoes and cucumbers from the garden, to eat that evening with dinner. Even then I recognized that few things are as wonderful as harvesting and eating fresh fruits and vegetables that you have grown yourself. And if you are gardening organically, you are in very real ways contributing to the health and well being of Earth. So, in 2010, with some prodding from my partner and love, Jesse, I left my job as a construction supervisor in New York City, and made it my mission to bring organic vegetable gardening to as many friends and neighbors as possible. Since then Home Organic Gardening Service (HOGS for short) has designed and installed more than 200 gardens, composting systems, hoop houses, and water management systems here on Long Island. I have over 25 years experience in the construction and landscaping industries, including expert tree surgeon and organic gardening certifications. I also hold an Interdisciplinary Bachelors degree from SUNY Oneonta, and a 200-hour Hatha Yoga Teaching Certification. Most recently, I earned Master Gardener certification through Cornell Cooperative Extension, as well as Permaculture Design certification through the Punta Mona Center for Sustainable Living and Education, el Caribe Sur, Costa Rica. I truly believe in my heart that the more people who experience the wonders of organic vegetable gardening for themselves, the healthier our world will be. Dylan and his friend Emmet, who has been front-yard gardening all of his life! Jesse and a basket of her beloved zinnias. I think of gardening as an extension of one’s own being, something as deeply personal and intimate as writing a poem. The difference is that the garden is alive and it is created to endure just the way a human being comes into the world and lives, suffers, enjoys, and is mortal. The lifespan of a flowering plant can be so short, so abbreviated by the changing of the seasons, it seems to be a compressed parable of human experience. even if on a small scale, in our own gardens.